A trio of Bundesliga players started for defending Copa America champions Chile in a disappointing 2-1 defeat to Argentina in their opening Group D fixture at this Centenario edition. FC Bayern München's Arturo Vidal, Bayer 04 Leverkusen's Charles Aranguiz and TSG 1899 Hoffenheim's Eduardo Vargas were all in the line-up for La Roja in Santa Clara, California, alongside former Hamburger SV midfielder Marcelo Diaz and 1. FSV Mainz defender Gonzalo Jara. The match was a fast-paced affair between two of the tournament favourites but chances were few and far between in the first half. The best of them fell to Alexis Sanchez after Vidal teed him up on the edge of the box, but Argentina goalkeeper Sergio Romero was able to save. 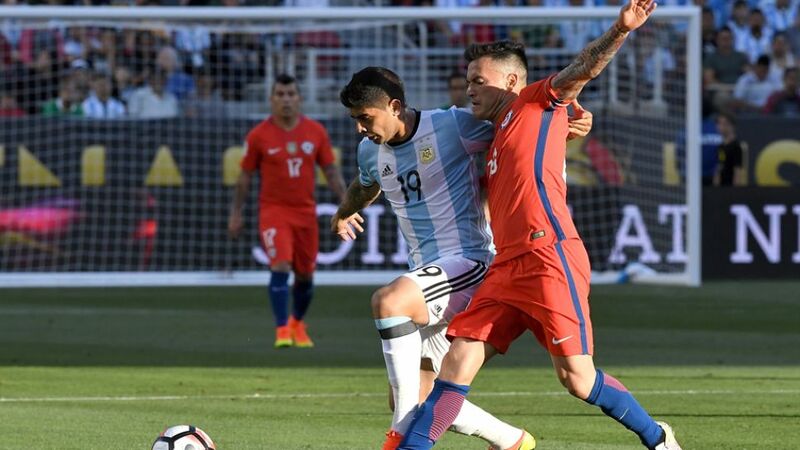 Argentina went ahead early in the second period through Angel Di Maria, before Ever Banega doubled their lead shortly afterwards. In characteristic fashion, Vidal refused to give up and led Chile's efforts to fightback, going close with a fierce drive that Romero did well to block. Substitute Jose Fuenzalida netted a stoppage-time consolation for La Roja, but it was too late to prevent them slumping to defeat in the first match of their title defence.